We all know the expression, “Beauty is in the eye of the beholder”, but is it really true? Art theorists and philosophers would answer “No, of course not!” and here I quote Dennis Dutton, famous art theorist who stated in his 2010 Ted Talk, “…it’s deep in our minds. It’s a gift handed down from the intelligent skills and rich emotional lives of our most ancient ancestors.” In other words, the experience of beauty is not subjective, but quite objective. There are clear guidelines or criteria to what constitutes beauty for all of us, based on our genetic pre-disposition. Now, how about this expression:“Teaching is an art form”. As teachers, we have all heard this opinion expressed and there may be some truth to it, but if this expression was entirely true, there would be no such thing as educational science. Is teaching efficacy subjective? When considering different disciplines, student demographics, time of day, and type of course, it becomes clear that there will always be a subjective element to teaching. But, to call teaching an “art” is to deny that it can be objectively analyzed, evaluated and improved based on scientifically grounded criteria. I believe teaching and learning is a science. I would also posit, that similar to our appreciation of beauty, effective teaching approaches are already “deep in our minds” and “handed down to us from our ancestors”. Let’s think about this for a moment. How does an infant best learn to walk? Should the infant listen to her parents and take notes? Alternatively, should the child attempt to walk by herself? How does a young child best learn to play soccer? Should he listen to his coach talk about it, or should he get on the field and start kicking that ball? How effective would it be to have our language learners spend an entire class session taking down notes from the board? More importantly, how can we even start thinking about these questions without a clearly defined scientific language on teaching and learning? Luckily, Benjamin Bloom provided us with one in 1956. I personally view “Bloom’s Taxonomy” as the single most powerful teaching and learning tool, enabling educators not only to objectively think about their craft, but also to enhance every facet of it through a deliberate scientific analysis. Bloom’s taxonomy targets three main domains: the cognitive, affective, and psychomotor domains. These basically constitute all of the elements at work when a student engages in learning. The cognitive domain encompasses the mental processes that are engaged when learning. The affective domain considers emotions and well-being and the psychomotor deals with all things in the purview of the reptilian brain, i.e. bodily-kinesthetic motion. English language learning combines all of these aspects. I wish to address the cognitive domain. Bloom’s cognitive domain ranks all mental processes on a “depth” level. The basic foundational level is “remember”- the simple mental process of memorizing and producing the required knowledge. The next level up is “understand”, which is the ability to explain concepts and their meaning. Next is “apply”, which takes into account that the learner “remembers and understands” and can now “do”. For example, Bob now remembers the simple present conjugation. He understands that the simple present is all about habits, but must now speak using it. This is considered more difficult than conjugating and has a deeper long-lasting imprint on the student. The deeper levels are “analyze”, “evaluate” and finally “create”. These six simple categories encompass any other verb to describe a learning task. Writing a business report would be synonymous with “apply”. Conjugating verbs on a worksheet would be synonymous with “remember”. The power of Bloom’s taxonomy resides in the possibility of aligning our teaching methodologies with the topic, the learning outcomes, and the students’ needs through a coherent scientific language. If the goal of your course is to get students to talk to one another using basic tenses, this should also be your classroom activity and assessment. 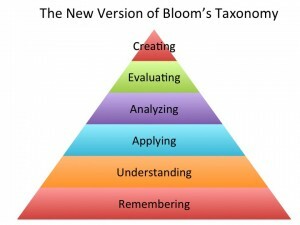 Do you use Bloom’s Taxonomy in your teaching? Can you share ways in which it has enhanced your planning or teaching? Interesting article and we’ll written. I don’t believe that teaching is so black or white. There can be gray areas too. I think as humans we like to slot information or methods into nice boxes. Teaching can be argued to be an art or science, or both. What ever works! I’ve learned over the years to adapt my teaching style to ensure that the learner reaches their goal. The two most important things I learned in life to assist learners was to find out what interests and what motivates them. Secondly, I learned about strategies that work for the individual learner that they can use. At the university level it’s too much information to memorize. Building on an interest or passion and practicing a strategy consistently using as many senses as possible over time allowed the information to be recalled without using memorization at all. Absolutely! Motivation is paramount. In this respect, doing everything possible to keep the student engaged and learning is so important and yes – there is an element of “art” to teaching, especially when you are in the moment, without over-thinking and things just work out smoothly and effectively.